A teaching resource tool designed just for your use. 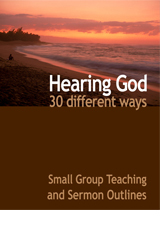 The Small group teaching section includes notes for five sessions with ice breakers and prayer suggestions. Also included are five sermon outlines. These notes are in a handy three-ring binder and on a CD in a Word document for you to personalize. Audio book and Book available!